The true beauty of the food truck is that you can get a great meal nearly anywhere. 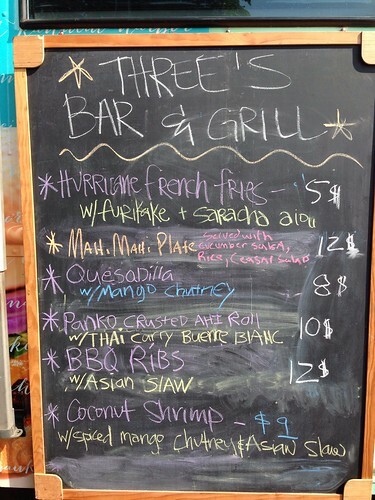 But in Maui County, some of our laws may limit this, as was the case with the Three’s Bar and Grill Food Truck. They initially started their truck business with the idea of taking their signature style of food truck cuisine to the surf scene. With a lot of big surf appetites on the island, that could have been a lucrative idea, but state and county laws put the kibosh on their plan. 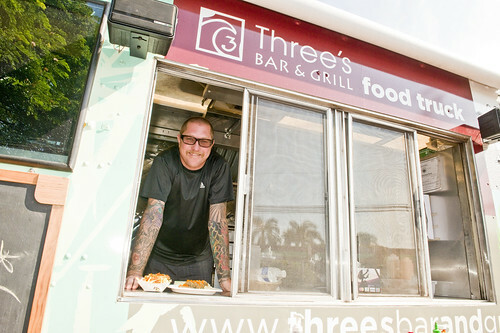 Three’s is definitely making headway as one of Maui’s most visible, versatile and colorful food trucks. They keep part of the week designated for the Pu’ukoli’i Train Station, and Friday nights for all the Town Parties their wheels can roll into. Plans are underway to find time for Paia as well. 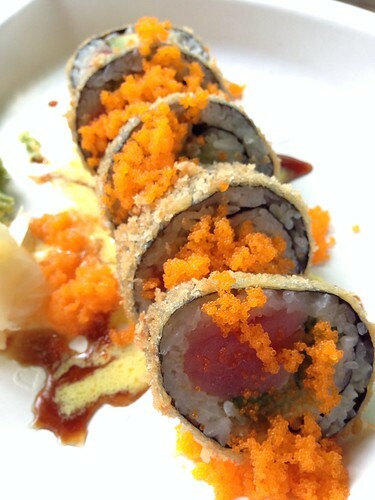 Their menu is creative and tasty, fusing Asian cuisine with bistro fare. When I dropped by the Pu’ukoli’i Station on a Wednesday afternoon, Chef Matt Hallendy was manning the truck and serving his most popular dishes. 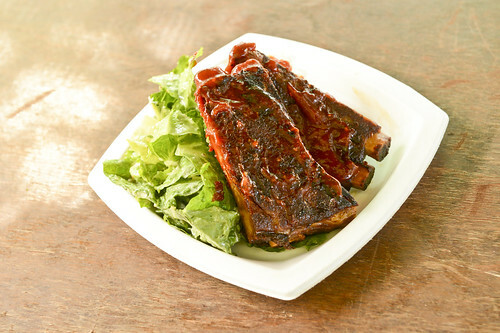 The barbecued ribs were moist, slathered with sauce and falling off the bone, and were served with an Asian slaw. 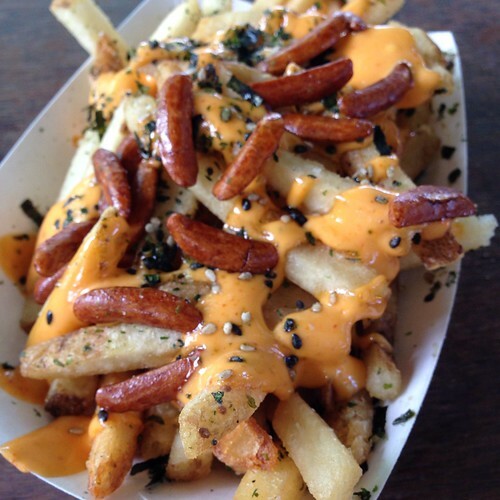 The truck also offered Hurricane Fries, which are a generous batch of crisp shoestrings full of furikake, aioli and arare. You don’t expect to see panko-crusted ahi rolls with Thai butter buerre blanc at a food truck, but it was here too, and it’s prepared according to Three’s distinguished techniques. Besides big competition ideas to keep the food truck standards fun, Blosser, and the two other chef Owners at Three’s Bar and Grill–Travis Morrin and Cody Christopher–find inspiration in their different cooking styles, Maui lifestyle and travel. The food truck project has given them a new outlet for their catering business and a new face to the the Three’s brand, but has also offered a great opportunity for creativity. Blosser says that’s key for them. 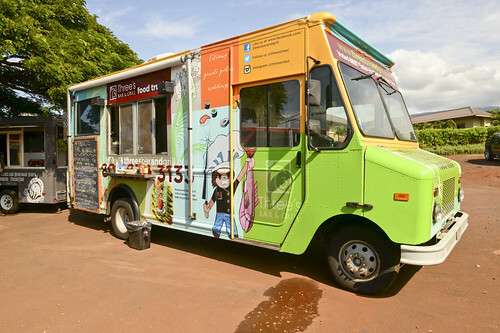 Despite all the fancy fixings, their food truck stays down to earth with menu standards like their Hamakua mushroom and Swiss Big Island beef burger, tacos, quesadillas and bacon-wrapped hot dogs. They also have a Facebook page where you can see the chefs snapping Instagrams of their latest dishes and posting about the truck.